The Mac Messages app may occasionally fail to send a message correctly, when a message fails to send it is made obvious by a little red (!) exclamation point and a “Not Delivered” message under the failed iMessage or text message. But you don’t have to retype the message or just let it go, instead you can use a little trick to resend the message again on the Mac. 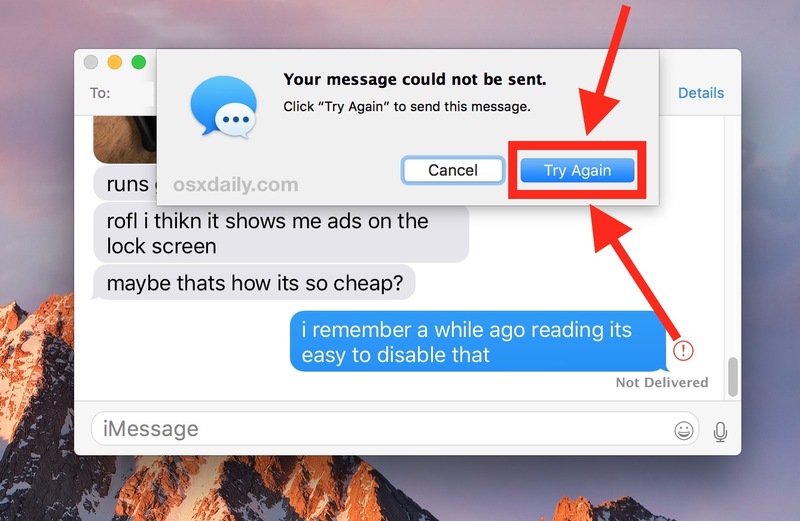 The iMessage or text message will attempt to resend, and usually as long as the Mac has internet access the message will send successfully the second time around when you choose the “Try Again” option. A similar trick can be done on the iPhone and iPad when messages fail to send from iOS too, again this is usually the result of inadequate internet data connectivity. Why does a message fail to send? There can be numerous reasons a message does not go through, but the most common reason is a blip in internet connectivity with the computer (or recipient) going offline. Also, it’ possible that iMessage itself may be down which can be checked easily, though that is rare. Sometimes there is an underlying issue with how iMessage is configured on the Mac too, but if the problem appeared spontaneously that is much less likely. Another issue you may encounter is the erroneously appearing repeated “message not sent” errors that may show up on a Mac that hasn’t been used in a while yet shares an Apple ID with another active Mac or iOS devices with many messaging activities ongoing. * Note that when an SMS text fails to send however you may see the (!) red exclamation point but not necessarily a “Not Delivered” message as you would with an iMessage, because SMS lacks the read receipts ability. 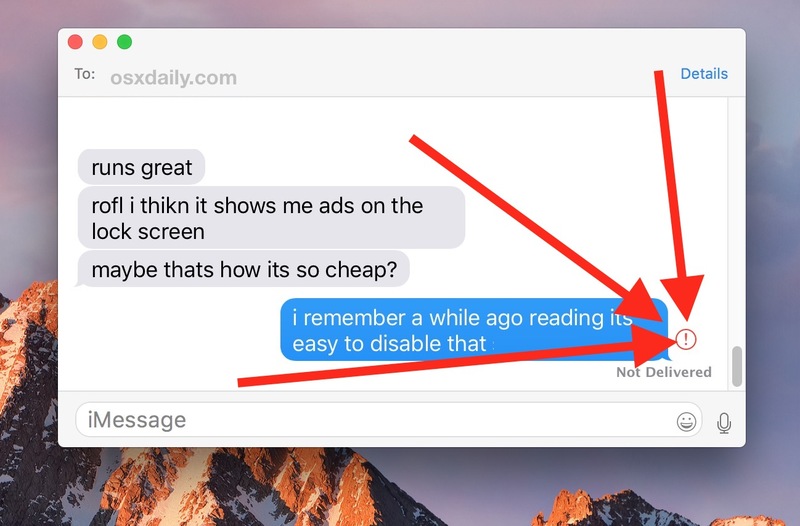 Have another trick for resending messages from the Mac? Let us know in the comments! There is also the option of Send as Text Message. Most of my failed messages send easily as Text Messages. Just got turned down for “already said that.” First time I’ve ever posted here. WTF? Get over it ellen. You are not a special snowflake. Which makes you a bully, Ted. Learn some manners, it’s embarrassing. Meh. While launching the “special snowflake” cliche is way heavier artillery than necessary here, anyone who closes an ostensibly helpful comment by saying “deal with it” isn’t exactly starting out on the most cordial footing, either. Ellen and Ted may well have more in common than they’d like to think. Cmon Ted, behave yourself. Don’t be a bully. Had a problem with this a few months back, all our iPads and iMac would suddenly not send or receive messages, the iPhone still did. We use Messages a lot to keep in touch with family. Have been with the same ISP for many years. Tried everything I could think of and spent a couple of frustrating hours on the phone with Apple which included factory resetting one of the iPads trying to find the solution, but that didn’t solve it either. After about three weeks of no messages I tried changing the DNS to the Google Public DNS 8.8.8.8 and 8.8.4.4 and much to my surprise it was fixed! I don’t know enough to know why it fixed it, just glad it did. Changing DNS servers worked for me. Not sure why but it did. Thanks! The ““Your message could not be sent” will automatically appear in Sierra, making this a no brainer (IOW no need for a hint”) issue. As I recall, this also automatically appears in El Crapitan and Yosemite too.